The hunger strike held by seven activists in Brasília, capital city of Brazil, ended on Saturday, after 26 days. The announcement was made during a solidarity rally staged by supporters and organizations that took part in the protest. Gathered with supporters at the Brasília Culture Center, where they have been accommodated since they started fasting, on Jul. 31, the activists launched a manifesto on Saturday officially ending the protest. They wrote that the hunger strike achieved its goal and contributed to the struggle against the 2016 coup and its consequences. “We feel victorious, as this is how the people who struggle feel, and we’ve built up important things for people’s struggle as a whole,” the manifesto reads. 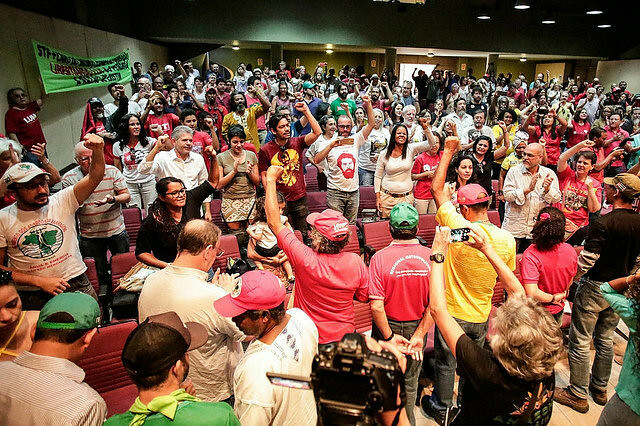 The strikers pointed out that the protest is also about people’s sovereignty, the control of Brazil's resources – such as oil –, and people’s right to decide the paths of the country. In this sense, they once again demanded freedom for former president Luiz Inácio Lula da Silva, who has been in prison since Apr. 7 in Curitiba, southern Brazil, even though his case is still pending appeal. The activists also pointed out that there is a “judicial dictatorship,” criticizing the Supreme Court. People’s movements have been pressuring Brazil’s top court to review petitions – called ADCs – that question the legality of imprisoning defendants after their conviction is upheld by an appeals court, but while their conviction is not final. The matter directly impacts not only the former president, but also approximately 150,000 people who are in prison while their cases are still pending appeal in higher courts. The manifesto also denounces the fact that the Brazilian government is not complying with a request by the United Nations Human Rights Committee to ensure Lula’s political rights in prison. “Lula is innocent and is being held as a political prisoner,” the protesters wrote. João Pedro Stedile, from the national board of the Landless Workers’ Movement (MST), said the protest had many different positive aspects. The landless leader said the hunger strike made a major contribution to today’s political struggle, bringing the conversation about Lula’s freedom and the Supreme Court’s responsibility on this matter to the country and the world. “It was able to unravel the true nature of the Brazilian judicial system, galvanizing activists to come to Brasília on August 15th,” Stedile said. The date he mentions is when the Free Lula National March culminated in Brasília, when approximately 50,000 protesters marched to the Supreme Electoral Court to register Lula as a presidential candidate. Stedile also pointed out how important it was for the hunger strikers to receive support throughout 26 days of protest, arguing solidarity is a key political and civilizing principle. “You cannot build an equal, fair society if it is not based on the principle of solidarity and justice – and solidarity in the sense that we are all equal and we are only going to solve our problems if we help each other,” he said. In 26 days fasting, the activists received support from organizations, movements, groups, institutions, and individuals such as jurists, artists, political actors, and others. They received more than 500 letters of support.